The MycoLight Flow Cytometric Live Bacteria Assay Kit provides an easy and convenient methodfor evaluating bacterial vitality as a function of the intracellular esterase activity. MycoLight™ 520 is non-fluorescent esterase substrate that diffuse into both Gram positive and Gram-negative bacteria. Upon hydrolysis by bacterial intracellular non-specific esterase, a green fluorescent product is produced and accumulated within bacteria. Compared to the commonly used esterase substrate CFDA and CFDA-AM, this kit provides brighter and more stable signal with lower background and easier staining protocol. Incubate bacteria samples with MycoLight™ 520 at 37°C for 5-10 minutes or room temperature for 60 minutes in dark. 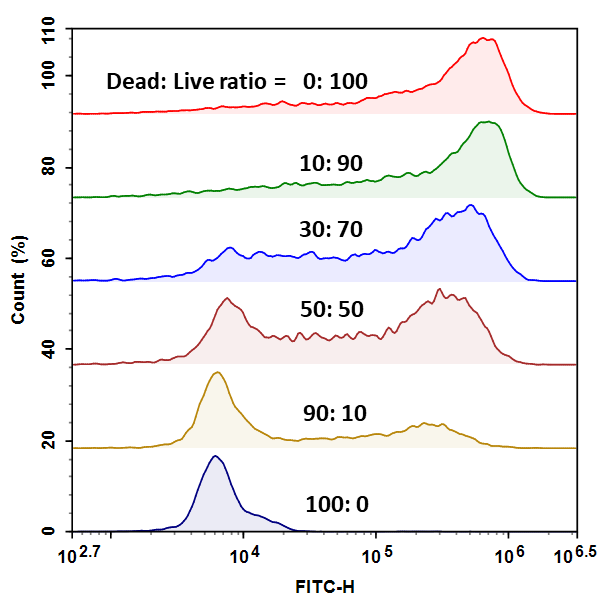 Analyze sample by flow cytometry with FITC channel. Add 100 µL of DMSO (Component C) into one vial of MycoLight™ 520 (Component A) to make 100X stock solution. Example of Live/Dead bacterial mixtrue preparation: Mix seven different propotions of the bacterial suspensions as in Table 1 for a total volume of 200 µL for each sample. Add 2 µL of the 100X MycoLight™ 520 stock solution to 200 µL of the bacterial sample in Assay Buffer. Add 300 µL of Assay Buffer (Component C) to increase volume before analyzing the cells with a flow cytometer. Monitor fluorescence of bacteria with a flow cytometer through FITC channel (488/530 nm). Note: To exclude debris, it is recommended to set the threshold of the flow cytometer as the following: FSC >10,000, SSC>5,000. Note: The efficiency of MycoLight™ 520 is highly strain dependent and the staining conditions should be optimized accordingly. Table 1. Example Volumes of Live and Dead samples to mix to achieve various Live/Dead ratios. Figure 1. Relative viability of E.coli suspension was analyzed using ACEA NovoCyte flow cytometer in FITC channel. The readings (Count(%)) were obtained from various Live/Dead E.coli mixtures (Table 1). The live and dead population in each mixture can be easily distinguished by the two distinct peaks.